This section provides a roadmap to Manual Pages for BICC User Adaptation Layer (BUA). This section provides a roadmap to Manual Pages for SS7 ISUP User Adaptation Layer (ISUA). This section provides a roadmap to Manual Pages for SS7 TCAP User Adaptation Layer (TUA). This section provides a roadmap to Manual Pages for SS7 SCCP User Adaptation Layer (SUA). This section provides a roadmap to Manual Pages for SS7 MTP Level 3 User Adaptation Layer (M3UA). This section provides a roadmap to Manual Pages for SS7 MTP Level 2 User Adaptation Layer (M2UA). SS7 BICC User Adaptation Layer (BUA) protocol layer transporting and distributing the services provided by bicc(4) and providing an IO Control interface, lmi_ioctl(4), for BUA-specific management, bua_ioctl(4). SS7 ISUP User Adaptation Layer (ISUA) protocol layer transporting and distributing the services provided by isup(4) and providing an IO Control interface, lmi_ioctl(4), for ISUA-specific management, isua_ioctl(4). SS7 TCAP User Adaptation Layer (TUA) protocol layer transporting and distributing the services provided by tcap(4) and providing an IO Control interface, lmi_ioctl(4), for TUA-specific management, tua_ioctl(4). 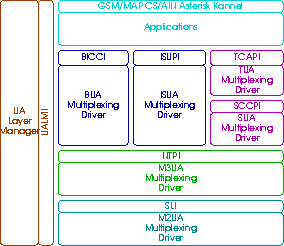 SS7 SCCP User Adaptation Layer (SUA) protocol layer transporting and distributing the services provided by sccp(4) and providing an IO Control interface, lmi_ioctl(4), for SUA-specific management, sua_ioctl(4). SS7 MTP3 User Adaptation Layer (M3UA) protocol layer transporting and distributing the services provided by mtp(4) and providing an IO Control interface, lmi_ioctl(4), for M3UA-specific management, m3ua_ioctl(4). SS7 MTP2 User Adaptation Layer (M2UA) protocol layer transporting and distributing the services provided by sl(4) and providing an IO Control interface, lmi_ioctl(4), for M2UA-specific management, m2ua_ioctl(4). ISDN Q.921 User Adaptation Layer (IUA) protocol layer transporting and distributing the services provided by dl(4), and providing an IO Control Interface, lmi_ioctl(4), for IUA-specific management, iua_ioctl(4). DPNSS/DASS 2 Extentions to the IUA Protocol (DUA) protocol layer transporting and distributing the services provided by dua(4), and providing an IO Control Itnerface, lmi_ioctl(4), for DUA-specific management, dua_ioctl(4). V5 User Adaptation Layer (V5UA) protocol layer transporting and distributing the services provided by v5(4), and providing an IO Control Interface, lmi_ioctl(4), for V5UA-specific management, v5ua_ioctl(4). GR-303 User Adaptation Layer (GR303UA) protocol layer transporting and distributing the services provided by gr303(4), and providing an IO Control Interface, lmi_ioctl(4), for GR303UA-specific management, gr303ua_ioctl(4). /dev/bua, /dev/isua, /dev/tua, /dev/tua-tpi-cl, /dev/tua-tpi-co, /dev/sua, /dev/sua-npi, /dev/sua-tpi-cl, /dev/sua-tpi-co, /dev/m3ua, /dev/m3ua-npi, /dev/m3ua-tpi-cl, /dev/m3ua-tpi-co, /dev/m2ua, /dev/m2ua-cdi, /dev/m2ua-dlpi, /dev/iua, /dev/v5ua, /dev/gr303ua. ss7confd(8), isdnconfd(8), SS7(4), ISDN(4), MG(4). This manpage was updated Tue, 18 Nov 2008 12:05:10 GMT for OpenSS7 release 0.9.2. Most of the devices and modules listed here do not appear until strss7-0.8.4. m2pa(4) first appeared in strss7-0.8.2. is a trademark of OpenSS7 Corporation. is a registered trademark of Linus Torvalds. is a registered trademark of The Open Group. is a registered trademark of Sun Microsystems. The OpenSS7 Project: Package OpenSS7 version 0.9.2 released Tue, 18 Nov 2008 12:05:10 GMT.